I thought I would start this diary to enable people to see how I get on with my roaccutane treatment. I am 20 years old and have suffered from acne for 7years. I was on dianette for a year then stopped taking it and spots came back even worse. I then decided to go on roaccutane after seeing my dermatologist as I initially wanted to aviod taking more tablets but he said that my acne was too deep to go away with out some kind of medication. My initial blood test were normal so after a month on dianette (pill) I was prescribed the roaccutane. I have gone private to avoid the wait on the NHS but its not cheap. I am really happy that I did go private now as I have a lot of time to chat with my dermatologist who is brilliant and am also able to ring him anytime of day or night if i have any problems. Being such a strong drug it puts my mind at rest. I took a 40mg dose for a month and then had another set of blood tests. My cholesterol rose due to the roaccutane but it is still with in normal levels so I stayed on the drug. My dermatologist has never had to take anyone off the drug because of this which was reassuring. I was of course worried about depression and the other side effects however, my dermatologist said that in the 10 years he has been prescribing the drug he has only had one patient get slightly tearful and that stopped when she came off it. I am also aware that the first round of treatment may not work and 30% of people need a second course of course I hope this is not me but I'm prepared. I have had a few problems with increasing the roaccutane dose to the 60mg dose required for my weight. I have experienced a few light headaches but am not sure if this is the roaccutane or stress as am just getting ready to go back to uni. My dermatologist said that I should alternate the 40mg and 60mg doses for a week and then try the 60mg dose. However, the headaches are nothing to worry about unless you get visual changes which I haven't (very rare). He said that I can also take the 40mg dose for the remainder of the course if need be and it should work just aswell if not better and will not do any harm to my liver being on the drugs for longer. Here is a picture of my skin after being on the drugs for 8 weeks. My skin has got worse but it will get better in a few weeks my dermatologist assures me it just takes a bit of time as my acne of so stubborn however, in some people it clears up straight away. I have experienced dry skin and dry lips the best thing for them are Eucerin creams as they are very moistursing and you can still wear make up with them. Vaseline is best for the lips. This is my skin on a good day. Its like this all over my face and back. Please ask me any questions you may have, I've been on the drug now for 10 weeks. Best of luck with roaccutane, hope you get some great results with it. I wanted to ask, when you were on the dianette how was your skin? Do you think it got worse because you were on this and then came off it? Good luck lara. Glad to see you're posting pictures. The before and after will be really inspiring to people that are either thinking about starting or are currently taking Accutane. i cant wait to see your results..and about your photo, do u have mostly red marks there? kazzer, I'm not sure if the dianette made my acne worse when I came off it. I think it just made it lie dormant for a while so when it did come back maybe it was at the stage it would have been if I hadn't been taking the dianette. Having said that my GP said that not everyone's acne comes back after being on dianette unfortunately I wasn't one of them. But the Dianette was brilliant when I was on it, I had the occasional spot but other than that it was brilliant, which is why it was so annoying when my acne came back. tenshigirl25, No the spots their are mostly under the surface but I do get red marks when they go which last for a week or two. I do get a lot of whiteheads, but I always squeeze them (I know I shouldn't) because otherwise my make up looks awful. u remind me of myself..i was taking diane for about 8 months and it just kind of happened 1 day inabout the 7th or 8th month where my skin was clearing up really well..i was overseas at the time and having a good time so i took my nice skin for granted, gave up taking Diane and about 3 or 4 months later it satrted to come back. About another 2 or 3 months it was getting worse so i went back on the pill again..ive now been on it again for about 4 months and im in my 3rd week of accutane. If your skin is anything like mine, it can go from looking horrible to when it does start to clear, it clears fast..im up and down and all over the place so i hope this will end my problems for good..
are u still on diane now? 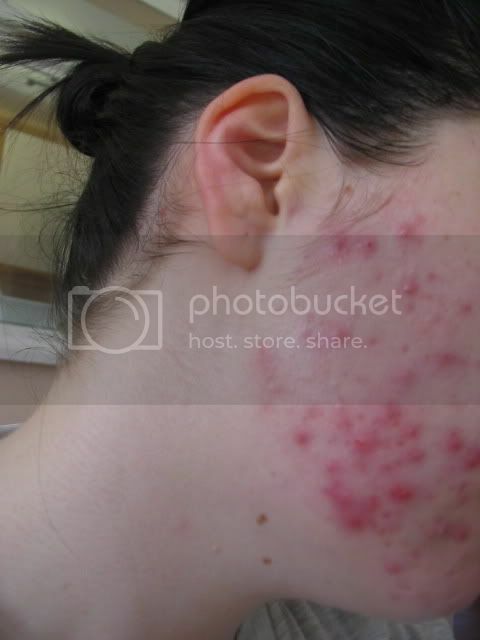 do u think once we finish accutane, and staying on the pill this will keep our face clear in the long term? im 25 now by the way..so your lucky to be 20 and taking this now. Well I'm only dianette at the moment because they make women take it who are on accutane so that they don't get pregnant. I don't think dianette does a lot when taken with accutane. But my dermatologist says that I can come off the dianette when the accutane course has finished and my skin should be fine. if i do get acne again it will be because the accutane has not worked and then I would need another course of accutane. Yeah my skin can be great one day on accutane and then the next it flares up again. My acne is getting a lot worse and I'm into week 10 of treatment. Did anyone else find that it was taking a long time for the accutane to work or it made their spots like 100X worse? I'm on week 7 and worse. Not as bad as week 1-3, but worse than before the pill. KittyK said that she didn't clear until month 5.
good luck with everything, best wishes. Hang in there! During my first course of Accutane, I saw no results for the first four months -- in fact, I got worse. I was very depressed and disappointed, but I stuck with it & I suddenly cleared up at the very end of the course, between months 4-5. Be patient & have faith -- clear skin IS worth it in the end. Having a bad day today. My skin is really dry despite using loads of moisturiser, I have loads of new spots and my make up is looking crap. I just hope that my skin gets better soon. I'm gonna get some antibiotics from my dermatologist i thinks its erythromycin. Has anyone else tried this to reduce outbreaks, does it work? DIOR SKIN AIRFLAH - Its the one in the spary can. I thought I would leave it a while before posting again to see how my skin is after a month. Here are some photo's i'm currently on 60mg/day. Only side effects are dry lips and skin but its very managable. The pain associated with the inflammation of the acne has gone and all I have now is red marks, which should go eventually. I'm really loving accutane at the moment. I know my skin looks quite bad but at least my skin is flat now and not covered in loads of bumps. I just can't wait for the red marks to go. Does anyone know how long roughly it should take? I would say perhaps 6 to 8 months on normal skin. Since you're using accutane, maybe in a year the color will be completely faded. The pits and the scars still remain unfortunately. I haven't got that many pits, well not as many as I thought I would get when my acne got really bad. I also don't think I any scars just red marks but I suppose they would be scars if they don't go away. Hope that you are all getting ready for christmas. Roaccutane has been going really well only get one spot now very occasionally. I only have red marks now which are slowly fading as you cen see from the pictures from before. I don't really have any pits in my skin which is good as my skin was really bad at th beginning and I have to admit that I was a picker. Anyway for anyone just starting, think about it or on roaccutane all I can say is hang in their I went through as really hard few months when the roaccutane made my acne much worse but it is so worth it when you come out the other side. I'll keep posting photos every month or so so you can see how quickly the red marks fade etc. Yeah, your skin does look great...soo inspirational. I just love reading these accutane logs because it gives me hope. I will be starting accutane next week(hopefully)!! You're doing great!! Good luck with the roaccutane. You might experience times when you wonder if its worth it but keep going as it so is when your skin starts to turn and one day you will just wake up with no spots and its the best feeling in the world. It may take a month or two so be patient. I'm still on roaccutane I started in late august so hopefully my skin should just keep getting better. Good Luck. hi larabeard you have made great progess, ive taken 40 mg almost 2 months now, and then i have an appointment on Jan 9th 06, do you think its a good thing that my dosage may be increased. i was on 40mg for a month and then put on 60mg. I had a few headaches when my dose was increased but i soon got used to them and they went, nothing serious. During this time i asked my dermatologist if it was possible to stay on the lower dose. He said that people often experience better results when on lower doses for longer and that you don't need to be on a really high dose to get great results. Your dosage will depend on how much you weigh but also on the experiences of your derm if they think that 40mg is enough then you should clear up really well, thats what my derm said anyway. I'm not even on the highest dose for my weight I could be on 80mg as I was inbetween the weight guidelines when I started. Hope this helps if u have anymore questions about roaccutane just ask.